Kehinde Wiley has become internationally recognized for his examinations of the aestheticizing of power and masculinity through the time-worn genre of portraiture. This major painting is an extension of the artist’s "Rumors of War" series, which takes the form of historic equestrian portraiture. In Wiley’s hands, this established genre expands in scale to over nine feet in each dimension, and explodes in color with a revelry of bold and bright hues. Opposed to tradition is also the fact that the sitters for these works are not the typical European nobleman in a powerful position but people the artist meets on the street, mostly from New York. Special workshops and education programs are being planned for the duration of this project. This work comes to SBMA from a generous loan, as well as support from Jeanne and Dennis Masel. "Kehinde Wiley: Equestrian Portrait of Prince Tommaso of Savoy-Carignan" is part of SBMA’s Park Projects: a new series of installations utilizing the grand stairwell at SBMA’s Park Entrance. Serving as the Museum’s main point of access during the ongoing renovation, this space, since August 2018, is the site of temporary installations of works by cutting edge contemporary artists. On view to the public for extended periods, these projects provide increased visual impact as well as opportunities for meaningful engagement. 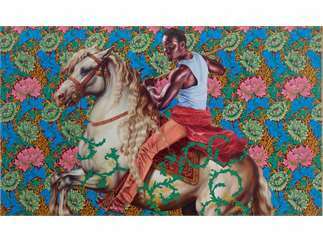 Image: Kehinde Wiley, "Equestrian Portrait of Prince Tommaso of Savoy-Carignan" (detail), 2015. Oil on canvas. Collection of Dennis and Jeanne Masel. Image courtesy of the artist and Roberts Projects, Los Angeles.